I call my invention, the " Double Diamond " putter because of its unique look. My putter is center shafted with equal amounts of weight on each side, allowing greater stability at address. I have developed two different heads. one with three lines of sight and one with two lines of sight. The two lines of sight on the putter head are engineered to the center and outer dimensions of the ball, dramatically increasing alignment. With its' unique club face that is only 3/8" at the center, and engineered bottom design, ground interaction is eliminated. You end up with controlled top spin and the sweetest spot ever designed. I have had this putter out to various golf clubs in the Calgary area, as well as visiting some master club builders. The reviews have all been the same. Get it out there. The market has been waiting for something like this. Not only the engineering end of it, but the unique design is the biggest seller. Some master club builders have called it " The Jetsons" putter. Something out of the future. When I was in club houses giving the resident pro a demo, I should explain here that I have 4 heads. 2 lefts and 2 rights, one of each style that look like they were bought off the shelf,people from pros to amatures would try it out and ask where they could buy one. The reviews from people, golfers or not, has been directed to the cosmetic beauty of these heads. With out the engineering behind it, the cosmetics alone would guarantee a top selling putter. At the present time, I am looking for a licensing agreement, or a sale. If interested please contact me at [Use the button below to contact me]. I can also be reached@ 403-629-3343 ( Canada). Or 984-166-4400 in Playa Del Carmen Mexico. If you would like a physical demonstration, call me and we can arrange a meeting. The heads can be shafted in seconds as it is part of my demo. My utility patent # is US 7,963,858 B2. The design patent# is US D618742 S. . At this time I will be happy to sell for the price of the patents That would be $12,000.00 USD.. Or I would be open to $3,000.00 U.S.D. and 2% royalties with a licensing agreement. 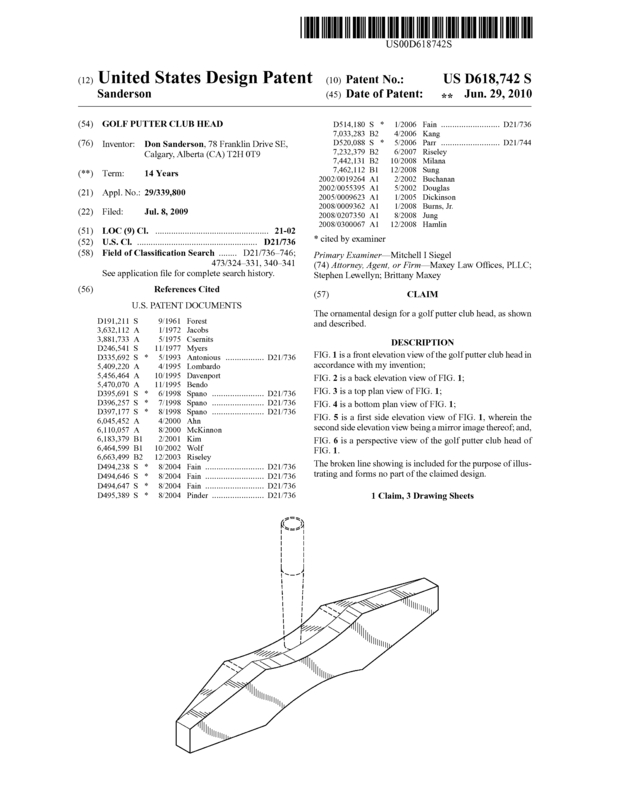 Page created at 2019-04-21 18:43:12, Patent Auction Time.